The Atrio I has 7 meeting rooms and 103 bedrooms distributed in its 4 floors (92 standard DeLuxe, 4 Junior Suites and 7 Suites). The central patio of this Atrio is the ideal place to project images during a convention or presentation thanks to its 480 square metres and its height of 20 metres. Besides the central patio, it has seven meeting rooms with different features which are adapted to your needs. The Salón Cartuja is the largest in this area con 420 square metres, large windows and direct access to the gardens. With capacity for 200 persons, it is the one most ideal for providing private catering services. As a complement, beside this Atro are the Triana, Heliópolis and Macarena rooms. The 4 Triana rooms, which can be panelled and have natural light, have direct access to the gardens and are situated beside the Cartuja. They are the perfect choice to use as sub-commission rooms. Their amplitude, versatility and luminosity make them the perfect icing on the cake which transforms this Atrio into an original venue with incomparable features for events which require exclusivity. 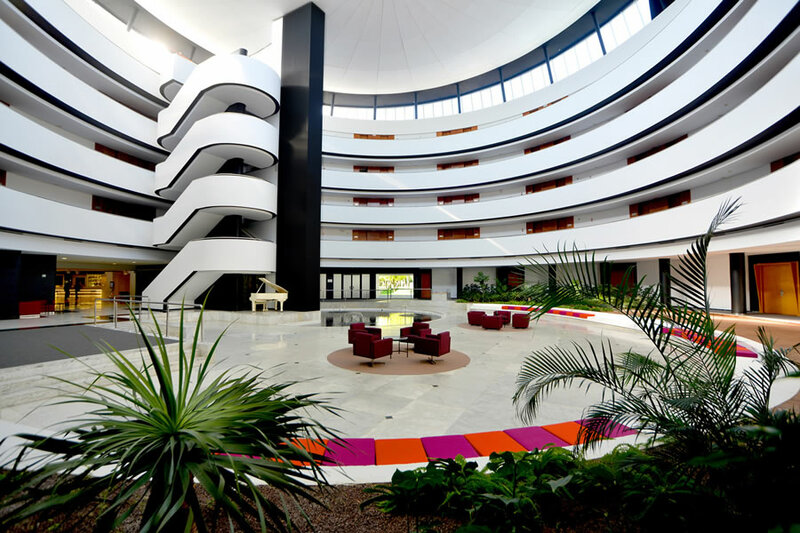 At the Barceló Sevilla Renacimiento Hotel we take into account the needs of each client, adapting the spaces to the requirements needed for each event. This is accompanied by the best attention paid from our team, exquisite gastronomy, car park, the latest technological equipment and the possibility to have the exclusivity over space for your event or convention. 480 square metres of open space with natural light, a height of 20 metres and capacity for 320 persons. 420 square metres with natural light, with capacity for 200 persons and direct access to the gardens. A meeting room measuring 35 square metres with capacity for 12 persons. Ideal for small meetings. A meeting room measuring 66 square metres and capacity for 60 persons. Perfect for intermediate sized meetings. The Triana Rooms (2 rooms measuring 50 m² and 2 rooms measuring 9 m²), which can be panelled and have natural light, they have their own foyers, direct access to the gardens and are located beside the Cartuja.